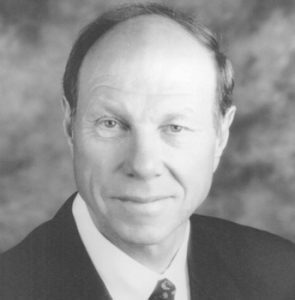 David E. Landon joined Pardee Construction Company in 1970, becoming President and Chief Executive Officer in 1984. He has contributed greatly to the unprecedented performance by Pardee, a Weyerhaeuser company. Pardee is noted as a major homebuilder and developer of quality master-planned communities; and in the past decade and a half has posted revenues in excess of $4.8 billion. David adheres to one goal in all development; to be a good neighbor by creating award-winning environments that enhance desirable homes for families, empty-nesters and retirees. Pardee communities are found from San Diego to Ventura County in California and throughout the Las Vegas metropolitan area. David places special emphasis on schools as a focal point of family markets. His commitment is demonstrated by ongoing and wide-ranging support of school-related clubs, charities and special events such as Boys' and Girls' Clubs, where he is a Golden Boy recipient, scholarship programs, booster club events, grad nights, marathon runs and bicycle races. In addition, Pardee's many Friend of School scholarships support special events, computer purchases and musical programs. He is Metro President of the Western Region Boy Scouts of America. As President of the Western Los Angeles County Council of the Boy Scouts of America, he was instrumental in establishing the Hoyt S. Pardee Eagle Scout Scholar Athlete Awards, which help outstanding Eagle Scout scholar athletes, pursue a college education. David has served as Chairman of the Pardee/Boy Scouts Golf Classic in Los Angeles, and together with other events, has been a major fund raiser for the Boy Scouts of America. He is the recipient of the Silver Beaver and Silver Antelope Awards. David' s longtime membership in the Building Industry Association of Southern California includes service on its Board of Directors. He has devoted many hours to the Mayor's Growth Management Task Force in San Diego, California and has faithfully supported the Pacific Coast Builders Conference. With all endeavors, David upholds the spirit, principles and practices of company founders, George Hoyt and J. Douglas Pardee, and has enhanced their legacy of quality development and community service. ​David and his wife, Ruth, reside in Encino, California, and are the parents of one daughter, Maia, and the proud grandparents of two grandchildren, Sara and Robby. David is a native of California and a graduate of UCLA.